SCENARIO: You are called to the Emergency Department to assess a 5 yo who hurt her right elbow falling from a swing. With a fall onto an outstretched hand - consider supracondylar fracture or fractureof the lateral condyle of the elbow. Also consider radial head fracture, elbow dislocation, Monteggia fracture or distal radius/ulna fracture. Examine radial/ulna/median nerves both motor and sensation (difficult in young child. Ask them to give you thumbs up and give the "OK" sign with fingers). Palpate for a radial & ulna pulse. Assess capillary refill. X-Ray of affected limb - true AP and lateral and images of joint above and below. Line drawn down neck of radius on AP film - should pass through the center of the capitellum) Used to assess for radial dislocation. A line drawn on a lateral view along the anterior surface of the humerus should pass through the middle third of the capitellum. In a displaced supracondylar fracture, this line will lie in front of the capitellum. 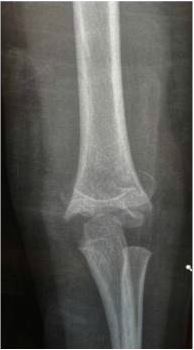 Anterior-posterior X-ray of a Gartland I fracture. Note no displacement of fracture line. 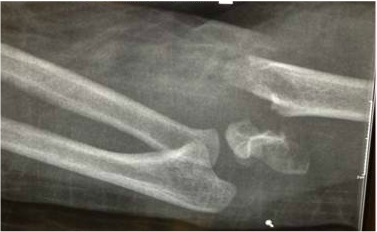 X-rays of a Gartland I fracture. Note extension of distal fragment but no displacement. Note anterior humeral line broken. Anterior-Posterior X-ray of a Gartland III fracture. Note overlap of fragments and shortening. Lateral X-ray of a Gartland III fracture. Note posterior displacement, shortening and angulation. Be aware of vascular or nerve injuries in this type. A pulseless supracondylar is an orthopaedic emergency. Arrange transfer to operating theatre ASAP and get urgent senior review. Consider compartment syndrome if very painful or very swollen, especially in displaced fracture. Pulses may return with reduction under anaesthetic or may require exploration with vascular/plastic surgeons +/- fasciotomy.